Daisy Ridley spills everything she knows about the next Star Wars Movies. “Me and Mark have been rehearsing a lot, and it’s really amazing. When we went back to Skellig to do the opening of [Episode] VIII, it was so crazy doing the same scene with a different crew of people. He’s amazing to rehearse with, and I’m very excited to be doing the rest of the stuff. 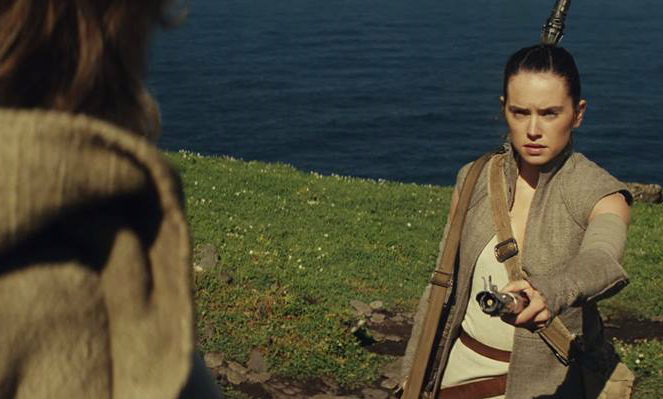 Speculation that Episode VIII would begin immediately after The Force Awakens began as soon as the credits began to roll after the first screenings, and then heated up when a short teaser announcing that Episode VIII had begun production showed that scene being shot with director Rian Johnson on set. Though some speculated this may have been reused footage from The Force Awakens, it was later confirmed to be all new footage shot by Johnson. It will be very interesting to see a Star Wars film pick up immediately after the previous one. But what's really exciting is what Ridley is saying about Luke's role in Episode VIII. It's no real surprise, given how The Force Awakens ended, but it's still intriguing to see what part he will play in the new film and how he will respond to Rey. Star Wars Episode VIII hits theatres on December 15th, 2017. The film is directed by Rian Johnson and stars Daisy Ridley, Mark Hamill, Adam Driver, John Boyega, Carrie Fisher, and Oscar Isaac. The opening crawl will say "Episode 8, if you saw 7, you're caught up"
Crossing my fingers that after their meeting, there is a training montage with "Eye of the Tiger" playing over the scene. In the voice of Unkar Plutt, "Quiet girl." - sry had to.